The BRK SC7010B smoke and carbon monoxide alarm is a state-of-the-art hardwired combination Smoke and Carbon Monoxide Alarm that serves multiple purposes in your home. This BRK combination smoke alarm works great as a standard smoke alarm with advanced photoelectric sensing that works smarter to ensure you get fewer false alarms. In addition to smoke sensing, the BRK SC7010B smoke and carbon Monoxide alarm detects carbon monoxide levels in the room; alerting you if levels are unsafe. The BRK SC 7010B incorporates a convenient 85db Spread Spectrum horn tone which alternates deeper frequencies which are easier for those who may be experiencing hearing difficulty or loss. When the BRK SC7010B smoke and carbon monoxide alarm is interconnected to one of the 18 available connections, you can easily identify if this alarm has initiated the system with an Initiating Alarm latch. Once activated, the latch will trigger, causing the connected alarms to sound. Inside the alarm is a backup battery compartment in case of power loss with a green power indication light. The BRK SC7010B smoke and CO alarm utilizes the advanced 360 OptiPath technology which has improved detection ability near wall and ceilings where other alarms may have difficulties detecting properly. It meets new construction requirements. 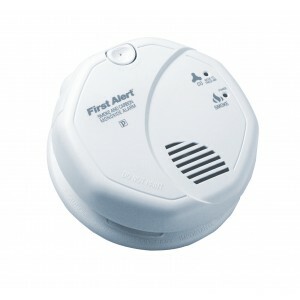 Interconnections: Up to 18 units of First Alert or BRK Smoke, CO and Heat Alarms. Maximum of 12 smoke alarms. Looking for a truly reliable fire alarm? Then you should definitely consider BRK SC7010B option - this is a word of a seasoned fireman. You know, choosing an alarm device is pretty easy when you have access to REAL statistics on the efficiency of this or that device - bet you will hardly find a better solution as for price-functionality ratio. An extensive set of features won't leave you indifferent.